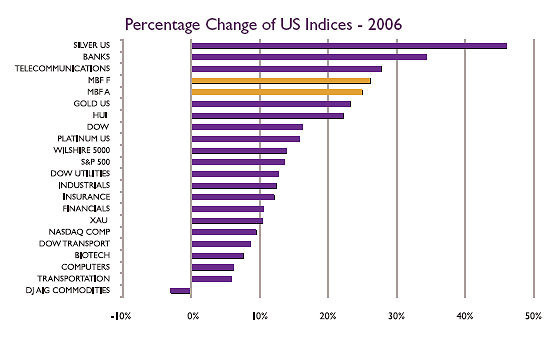 For most investors 2006 was a good year. The Dow Jones Industrial Average (Dow) reached new highs of 12,500, generating returns of 15% in US dollars. The Toronto Stock Exchange (TSX) also set new highs, and posted gains of 13%. Inflation was reported as a tame 2.5% in both the US and Canada. The only disappointing sector was income trusts, which suffered a loss of 2.7 % following changes in the tax rules. The accompanying chart of all the major indexes and sub-indexes in the US and Canada shows that silver outperformed all the financial assets in the US, and all except the Venture Exchange in Canada, generating returns of 46% in both US dollars and Canadian dollars. 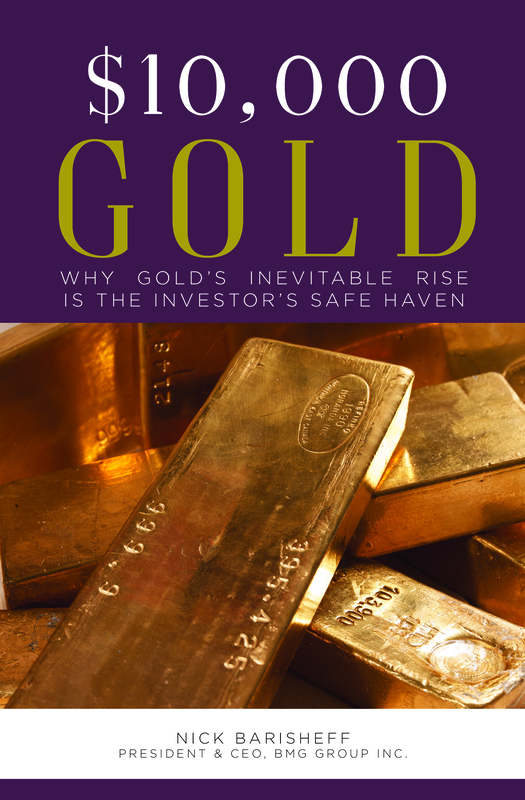 Gold outperformed all of the indexes except for telecommunications and banking in the US, and information technology, materials, the Venture Exchange and diversified metals and mining in Canada. More importantly, gold in US dollars outperformed the major mining indexes such as the XAU gold and silver index, and the HUI (unhedged gold mining stocks), and gold in Canadian dollars slightly underperformed the TSX gold mining index. The Millennium BullionFund’s Class A Canadian- and US-dollar units outperformed the spot price of gold, net of all fees and expenses, due to its silver and platinum holdings. Measuring gold’s performance using traditional comparisons provides an inaccurate analysis, because these ignore gold’s role as a currency and look at it simply as a commodity. 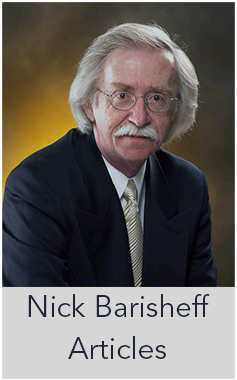 Since gold has a long history as a currency – 3,000 years versus 36 years for pure fiat US dollars – measuring its performance using currency comparisons generates more precise results. For example, the Dow in euros generated only a 4% gain, and the TSX in euros a 3% gain. Looking at gold and silver as currencies as well as commodities offers a different perspective. In 2006, using gold as a measure, the Dow lost 6%. 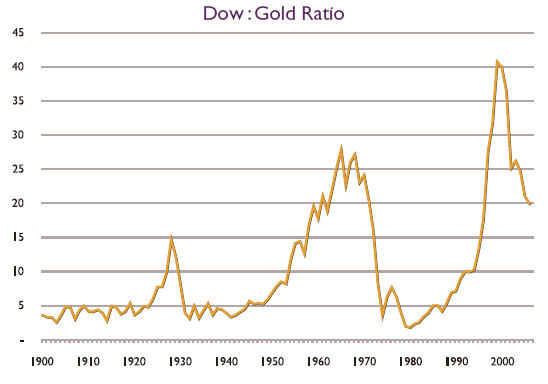 In January 2006, it took 20.9 ounces of gold to purchase the Dow. At year-end, an investor would have received back 19.7 ounces. Since the equity indexes posted gains, taxes were incurred, reducing the number of gold ounces even further. In silver terms, the difference is even more pronounced. In January 2006, it took 1,214 ounces of silver to purchase the Dow. At year-end, an investor would have received back 966 ounces for a loss of 20.4% before taxes. This example also applies to Canadian equities. While the commodity-heavy TSX made new highs in 2006 and generated a seemingly attractive 13% compounded annual return that year, it still generated a loss in gold terms. 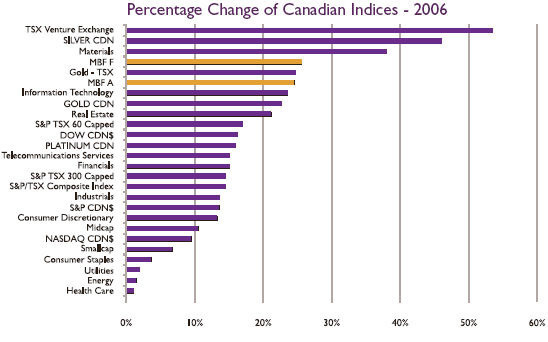 An investor who sold gold to buy the TSX at the end of 2005 would have 7% less gold today. In terms of silver and platinum, you would also have 22% less silver and 1% less platinum. Comparisons with gold should be currency-based: how did it maintain its foreign exchange value, for instance, and how well did it protect purchasing power. 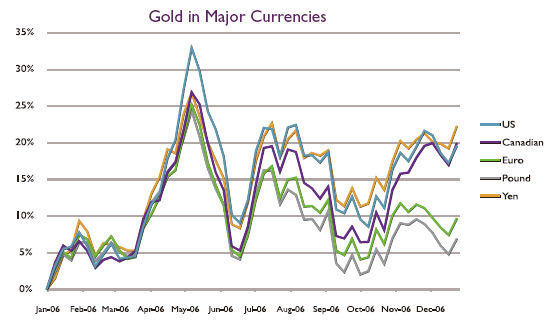 With respect to purchasing power, all currencies declined against gold in 2006. The reason why precious metals are rising in price becomes obvious when the rate of depreciation of currencies is taken into account. Although the US Federal Reserve stopped reporting M3 money supply as of March 2006, a number of analysts reconstructed the data and determined that it increased by 11% in 2006 to a staggering $12.5 trillion. 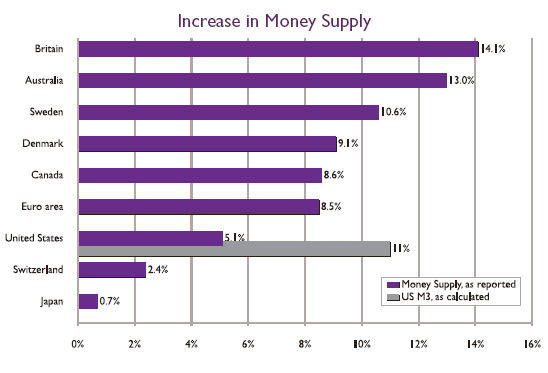 Since 2000, the US money supply has grown by 50%. Other countries have also increased their money supply to prevent their currencies from strengthening against the US dollar, and thus losing export competitiveness (please refer to chart on page 16). Measured in terms of increased purchasing power, using the Consumer Price Index (CPI) at 2.5%, gold’s purchasing power increased approximately six-fold in both Canadian and US dollars. During 2006, a number of other highs were achieved. The price of platinum reached $1,350 in November 2006, overtaking its all-time high of $1,070 set in 1980. According to a study conducted by Wainwright Economics, a Boston-based investment research and strategy firm, platinum is the lead indicator for future rises in inflation. 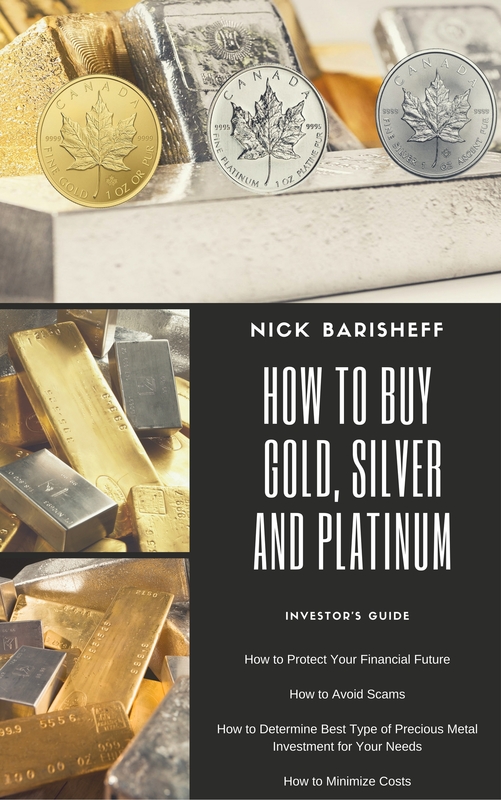 Since 2001, platinum has surpassed the performance of both gold and silver, and its price rise started six months prior to the beginning of the bull market in gold and silver. Oil reached an all-time high of $80 per barrel in August. A rising oil price is also a harbinger of rising inflation. Economic indicators in the US continued to deteriorate, with the Current Account deficit setting a new record at 7% of GDP. The US trade deficit of $772 billion also set a new record at 6.5% of GDP, featuring an $800 million per day deficit with China. Derivatives, which now stand at $370 trillion, grew by 24% in 2006. The magnitude of this number is hard to comprehend, but the risks come into focus when you consider that estimated global financial assets are $140 trillion and global GDP is $44 trillion, with US GDP of $12 trillion. If a sell-off occurs, losses could easily surpass available assets. While central bank sales and, more importantly, leasing has contributed to suppressing the gold price for the last 20 years, the tide seems to have turned. In the UK, Chancellor of the Exchequer Gordon Brown is under fire in parliament for selling almost 50% of the Bank of England’s gold reserves at the bottom of the market in 1997 -1998. So far this represents a loss of over 4.5 billion pounds. Although the signatories of the Washington Agreement could have sold 500 tonnes of gold in 2006, total sales amounted to only 350 tonnes. A number of countries, including China, Russia, Iran and the United Arab Emirates, announced plans to diversify their US-dollar holdings and increase gold holdings. Most notably, Russia announced it would increase its gold reserves from 5% to 10% by adding 2,000 tonnes. This represents about 80% of annual global production, and nearly ten years’ worth of Russian production. If other countries become nervous about continuing declines in their US-dollar reserves, an increase in demand from central banks could become the driving force behind rising gold prices. While some attribute gold’s climbing price to increased demand from Asia for jewellery, the major rise in demand has come from gold producers who are anxious to dehedge their production. In the past, some mining companies sold their production forward at fixed prices. As gold rose in price, however, these forward sales started to represent substantial losses. In 1998, inappropriate hedging caused the insolvency of Cambior and Ashanti in the space of a few months. According to Gold Fields Mineral Services Limited, from total gold production of 2,467 tonnes in 2006, mining companies bought 397 tonnes themselves, representing an increase of 500% over 2005. This still leaves a global hedge book of 1,478 tonnes. As gold prices continue to rise, mining companies will have to buy back their hedges in order to maximize earnings.